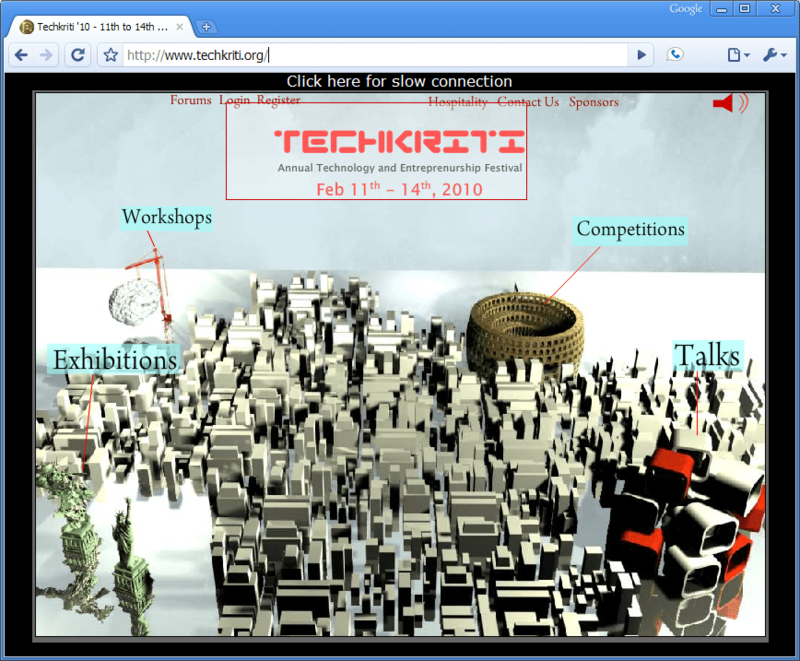 Lee.org » Blog Archive » SWARM at Techkriti, Kanpur India! SWARM at Techkriti, Kanpur India! 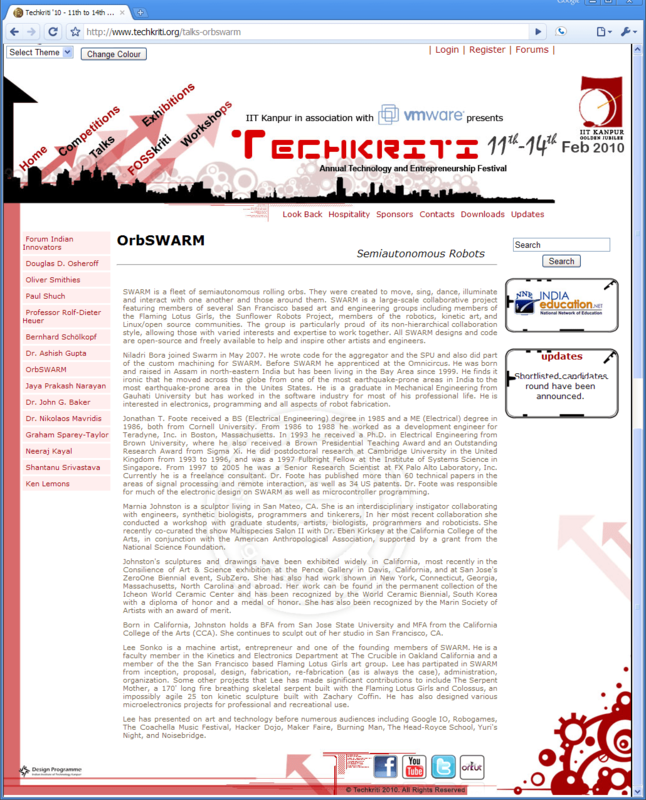 Along with 3 friends, I am will be presenting SWARM at the Techkriti Annual Technology and Entreprenurship Festival February 11-14th, 2010 in Kanpur India! Dr Jonathan Foote, Marnia Johnston, Niladri Bora and I will be exhibiting SWARM throughout the entire festival. On February 13th we will present our talk. Shantanu Srivastava – Managing Director & CEO, Ishan International Pvt. Ltd.
“When a person talks about his work, he is talking about a love affair”. Be witness to lectures that are sure to blow your mind away. 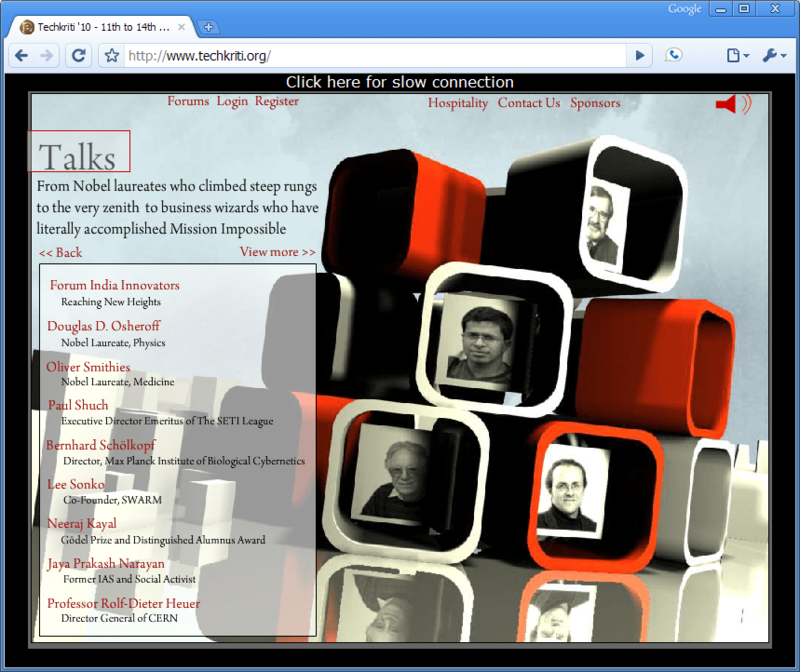 From Nobel laureates who climbed steep rungs to the very zenith of success to business wizards who have literally accomplished Mission Impossible, these talks have them all. This year we have talks with both a technial and an entreprenuerial flavour. From Turing award winners to “desi-innovators” with a rags-to-riches story, Techkriti ’10 has it all. The talks form the essence of the festival where the triumph of the human mind is celebrated. So no matter what keeps each one of us ticking, let us all come together to assimilate the distilled essence of the roads to success. SWARM is a fleet of semiautonomous rolling orbs. They were created to move, sing, dance, illuminate and interact with one another and those around them. SWARM is a large-scale collaborative project featuring members of several San Francisco based art and engineering groups including members of the Flaming Lotus Girls, the Sunflower Robots Project, members of the robotics, kinetic art, and Linux/open source communities. The group is particularly proud of its non-hierarchical collaboration style, allowing those with varied interests and expertise to work together. All SWARM designs and code are open-source and freely available to help and inspire other artists and engineers. Niladri Bora joined Swarm in May 2007. He wrote code for the aggregator and the SPU and also did part of the custom machining for SWARM. Before SWARM he apprenticed at the Omnicircus. He was born and raised in Assam in north-eastern India but has been living in the Bay Area since 1999. He finds it ironic that he moved across the globe from one of the most earthquake-prone areas in India to the most earthquake-prone area in the Unites States. He is a graduate in Mechanical Engineering from Gauhati University but has worked in the software industry for most of his professional life. He is interested in electronics, programming and all aspects of robot fabrication. Jonathan T. Foote received a BS (Electrical Engineering) degree in 1985 and a ME (Electrical) degree in 1986, both from Cornell University. From 1986 to 1988 he worked as a development engineer for Teradyne, Inc. in Boston, Massachusetts. In 1993 he received a Ph.D. in Electrical Engineering from Brown University, where he also received a Brown Presidential Teaching Award and an Outstanding Research Award from Sigma Xi. He did postdoctoral research at Cambridge University in the United Kingdom from 1993 to 1996, and was a 1997 Fulbright Fellow at the Institute of Systems Science in Singapore. From 1997 to 2005 he was a Senior Research Scientist at FX Palo Alto Laboratory, Inc. Currently he is a freelance consultant. Dr. Foote has published more than 60 technical papers in the areas of signal processing and remote interaction, as well as 34 US patents. Dr. Foote was responsible for much of the electronic design on SWARM as well as microcontroller programming. Marnia Johnston is a sculptor living in San Mateo, CA. She is an interdisciplinary instigator collaborating with engineers, synthetic biologists, programmers and tinkerers, In her most recent collaboration she conducted a workshop with graduate students, artists, biologists, programmers and roboticists. She recently co-curated the show Multispecies Salon II with Dr. Eben Kirksey at the California College of the Arts, in conjunction with the American Anthropological Association, supported by a grant from the National Science Foundation. Lee Sonko is a machine artist, entrepreneur and one of the founding members of SWARM. He is a faculty member in the Kinetics and Electronics Department at The Crucible in Oakland California and a member of the the San Francisco based Flaming Lotus Girls art group. Lee has partipated in SWARM from inception, proposal, design, fabrication, re-fabrication (as is always the case), administration, organization. Some other projects that Lee has made significant contributions to include The Serpent Mother, a 170′ long fire breathing skeletal serpent built with the Flaming Lotus Girls and Colossus, an impossibly agile 25 ton kinetic sculpture built with Zachary Coffin. He has also designed various microelectronics projects for professional and recreational use. Lee has presented on art and technology before numerous audiences including Google IO, Robogames, The Coachella Music Festival, Hacker Dojo, Maker Faire, Burning Man, The Head-Royce School, Yuri’s Night, and Noisebridge.